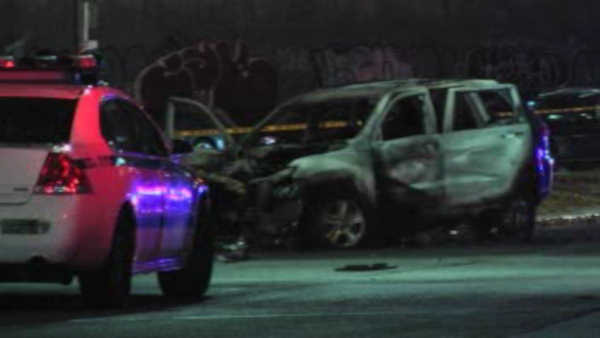 KEW GARDENS, Queens (WABC) -- A man was killed Saturday after a fiery crash in Queens. Police say a car was driving very fast when it hit a barrier on Union Turnpike near Queens Boulevard and caught fire. The driver of the vehicle was pronounced dead on the scene. A man nearby witnessed the crash and tried to help, but said the flames were too much. "As soon as he hit, there was a fireball. I grabbed my phone, called it in right away - grabbed a hammer, and there was a bunch of people here, and it happened very fast...there was just too much fire, we couldn't do anything," said Eli Arons. The passenger in the vehicle was taken to the hospital with serious injuries. The crash is now under investigation.